SAO PAULO, Brazil -- The Brazilian government raised the death toll of a bus accident to 54 while police continued their search for more victims Sunday in the rugged lands of southern Brazil. The dead include at least eight young children, three adolescents, 24 women and 14 men, the government of Santa Catarina state said in a statement earlier Sunday when the death toll stood at 49. There was no breakdown by age or gender given on the five additional casualties reported later. The bus plunged 1,300 feet down a mountain near the city of Joinville on Saturday. Ten people were transferred to nearby hospitals with severe injuries, and only one patient has been reported in stable condition. Officials earlier warned that the death toll could rise because more bodies could be found under the bus and in the woods. Police officers and emergency personnel started working on removing the bus on Sunday from the mountainous area in Serra Dona Francisca. Later, Brazilian President Dilma Rousseff said the number of people confirmed killed had risen to 54, and she sent her condolences to their families. "In this hour of pain and suffering, I want to extend my sympathies to the families and friends who lost their loved ones," Rousseff said in a statement. 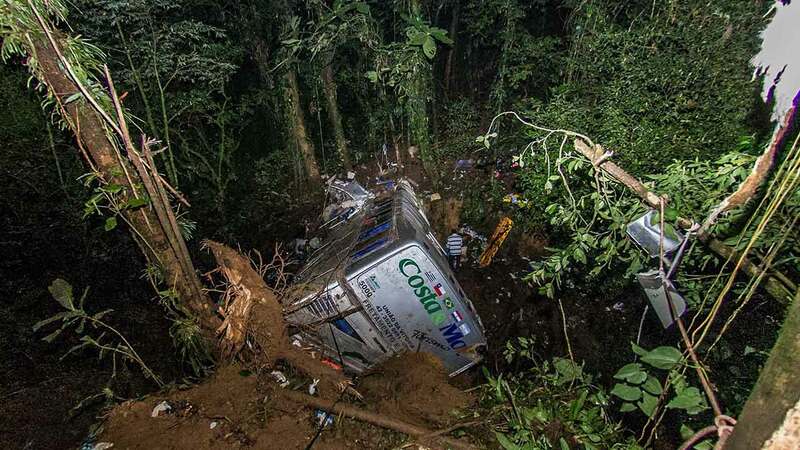 The bus crashed on a curvy road that winds through a verdant green region popular for hiking and biking in Santa Catarina state, located about 600 miles (950 kilometers) southwest of Rio de Janeiro. Although the cause of the accident is under investigation, authorities suspect the driver may have lost control on a curve, causing the bus to run off the road. The group was traveling from Uniao da Vitoria for a religious event near the coast in Parana state. The bus company could not be reached for comment.